Four journalists spoke to me about the story following my update above, Fergus Ryan at China Spectator, Tania Branigan at The Guardian, Austin Ramsey at The New York Times and Gwynn Guilford at Quartz. “I’m very unhappy about it. I think it’s really unprofessional. Especially as I was only sharing things that are already in the public domain,” Ms Couchman told China Spectator. 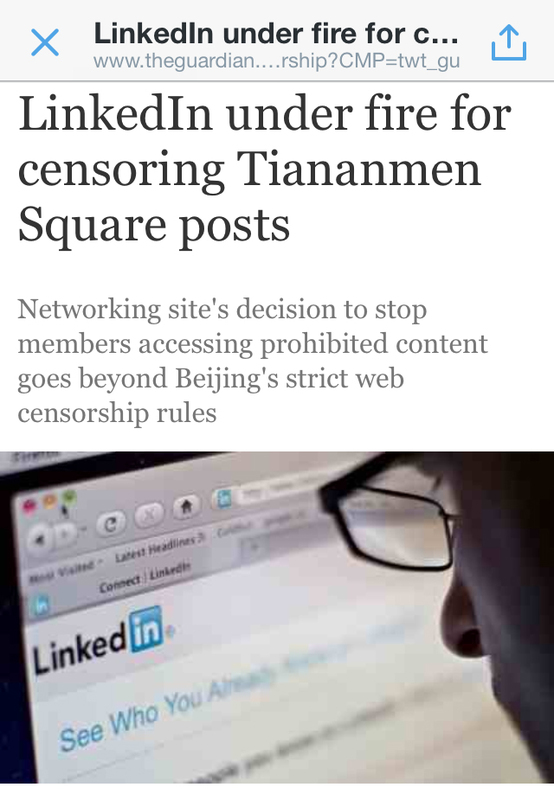 Business networking site LinkedIn has said it will stop users seeing content posted from China that breaches the country’s strict censorship laws, after members complained that posts related to the Tiananmen anniversary had been blanked out. LinkedIn is one of the few foreign social media services accessible from mainland China – where Facebook, YouTube, Twitter and others are blocked – and launched a Chinese-language service earlier this year, but does not have servers on the mainland. Its decision goes beyond Beijing’s requirements to restrict what users in China see and effectively exports some Chinese controls on content, though a spokesman said it was intended to protect users. 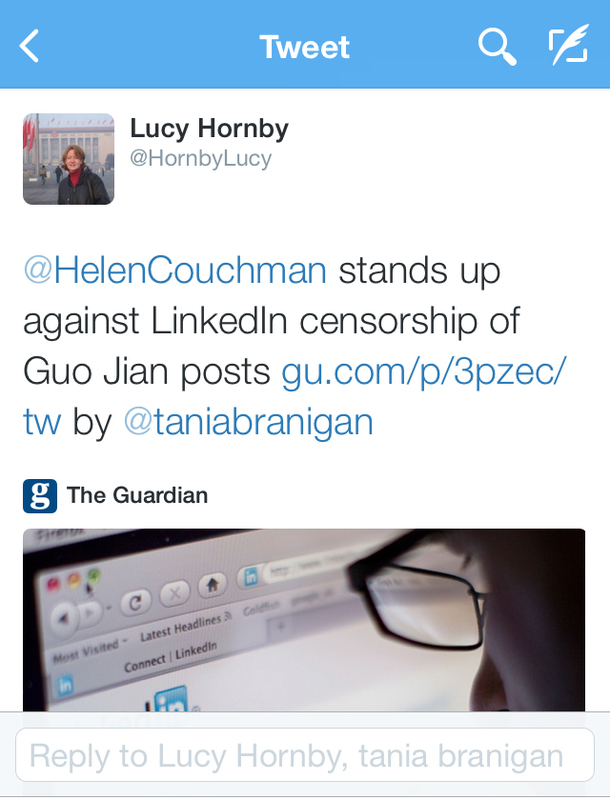 Artist Helen Couchman and journalist Fergus Ryan both reported receiving messages warning them that items they had posted would not be seen by LinkedIn members as they “contained content prohibited in China”. Couchman, who lived in China for several years, said the decision to block articles she had shared about detained artist Guo Jian was outrageous. “I wasn’t even sharing an opinion,” she added. Guo, who has Australian citizenship, was taken away by police in Beijing shortly after the publication of an interview in which he described participating in 1989’s pro-democracy protests in Tiananmen Square and discussed a work he had created commemorating the bloody crackdown. Ryan said in an article for the China Spectator site, for which he reports from China, that he too had posted pieces about Guo. But the site is also preventing people outside China from seeing material that censors disapprove of if it was first posted from China. Pua said: “Outside of China, members will be able to view content that is restricted in China, unless that content originated in China – this is to protect the privacy and security of the member who posted that content. While most Chinese rely on heavily censored Chinese services – such as the Sina Weibo microblog – some, including many activists and dissidents, use VPNs or other methods to post material on Twitter and Facebook. LinkedIn said in February that it was applying to set up operations in China, acknowledging it would need to comply with Chinese government demands to filter content. 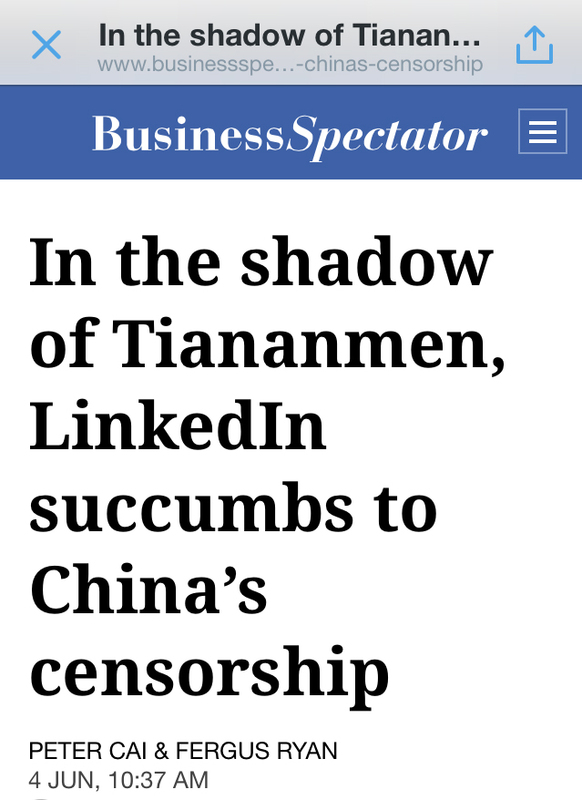 Cynthia Wong, senior internet researcher at Human Rights Watch, said that while she was not aware of the LinkedIn case, “the best practice that has emerged is that companies will not censor for the world”. He compared it to Microsoft’s decision to remove his Chinese-language blog in 2005 – a move that sparked international criticism.